What is the purpose of the collection and how will it be used? We are confident that this collection will encourage academic interest, and lead to papers, books, theses, magazine articles and such on the United Empire Loyalist period in Canadian history. It is readily available to students, scholars, historians, genealogists, authors and the public if they are interested. This is a huge undertaking, but the benefits will contribute to a better understanding of our Loyalist Forefathers, and what they endured to establish this great land of Canada. Most North Americans have little or no knowledge of their origins, or the hardships that their forefathers suffered so that we can live with the British system of democratic Government that we enjoy. This collection will ultimately benefit every Canadian, they will have a better understanding of the origins of our country, and that is important, not only for those of us who were born here, but also for the many multi-cultural immigrants who make up our population today. The headings for the links above give a general indication of the contents, the collections include many other family members and families associated with the principal families. These family records have been made available to you, the researchers of the 21st Century because descendants of these families valued their families' history. 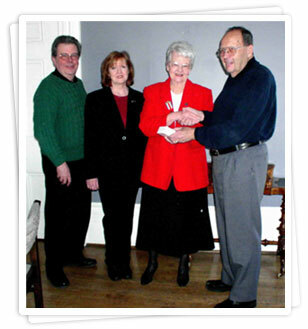 They generously donated their papers and images to Special Collections and Archives at Brock University, where they knew their heritage would be preserved forever. Dedicated staff have catalogued, described and digitized 1000s of items so that they are accessible to you, searchers throughout the world. We hope you find them useful in your research. If you find information that is especially useful to you in your research please contact us and tell us about your find. A complete inventory of the Loyalist Collection is available in a printable format by clicking the "Inventory" button below. present the microfilm "Registrar General Register"
to the Friends of the Loyalist Collection at Brock University.